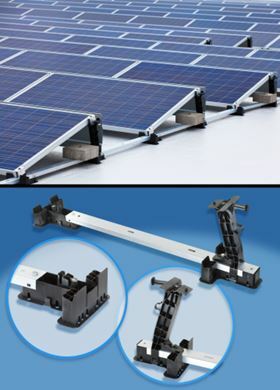 Goldbeck Solar's mounting structure for flat-roof solar installations consists of three plastic parts and one metal part. The first project – a 300 kW system – went into operation in the Aschaffenburg area of Germany in October 2012. Thanks to this new system, which comprises support elements made of plastic and stamped metal parts, solar panels can be installed on flat roofs quicker and more easily. Up to now, substructure systems for photovoltaic (PV) installations on flat roofs have been made primarily of steel and aluminium. Goldbeck Solar, headquartered in Bielefeld, Germany, has launched the mounting system under the brand name SUNOLUTION. Its first customer project, a 300 kW system, went into operation in the Aschaffenburg area of Germany in October 2012. The mounting substructure consists of a few individual parts: two identical pedestals made of plastic are joined together by a metal rail. A plastic bracket is mounted vertically on the rear pedestal by means of a snap-on connection and simple screw elements. In this manner, the front pedestal and the plastic bracket form the contact surface for the PV module, providing an ideal angle for incident sunlight. The dual function of the pedestal not only simplifies the installation but also reduces logistical effort and thus fixed costs. The Ultramid glass fibre reinforced polyamide (PA) can be used in outdoor applications since it has a very low tendency to creep, even at high temperatures (up to 80°C) and exhibits high toughness and stiffness down to temperatures of -30°C. It is also UV-resistant and weather-resistant. BASF’scomputer-simulation tool Ultrasim® made it possible to optimise the components to meet PV-specific requirements such as exposure to snow and wind loads, and to achieve a low intrinsic weight. In a single manufacturing process, Ensinger, based in Nufringen, Germany, was able to incorporate snap-on connections, ribs and cutouts for draining water and laying cables. A thermoplastic composites lab has been opened in Holland. Using thermoplastic to make a composite part could reduce manufacturing time by 20-30%. UK machining company Shape Machining Ltd has launched a new process that it says can reduce the time it takes to make thermoplastic carbon composite parts.